Petition Signature Signer #6628 by Gareth D.
Hard to believe, but it's been 5 years since we launched the Release "Time Fades Away" Petition campaign. Since February 2005, over 100,000 visits have been logged to the TFA page and the petition has gathered nearly 15,000 verified signatures. (The actual count is closer to 20,000 but the petition site has had several backup failures where thousands of signatures were lost.) Over 13,000 votes have been cast for favorite song on album. So why does any of this really matter? Well, for one thing, recent news indicates that there is a possibility that the original TFA may NEVER be re-released at all. From an interview in Guitar World, Young discusses The Archives Vol.#2 which will include Time Fades Away II. TFA#2 is an alternate version from the tour's second half. "YOUNG: One thing I'll tell you about the next volume of Archives is that Time Fades Away II is in there. And it's interesting because the whole thing has a different drummer than what was on that album. I switched drummers halfway through the tour- Kenny Buttrey was in there for the first half, and Johnny Barbata came in for the second. It's a completely different thing, with completely different songs. So that's interesting. There's lots of stuff like that that I'm working on right now for the second volume." Again, why does this matter? It's been called the "missing link" of the "Ditch Trilogy". So if you haven't done so already, go and sign the petition! And if you have signed, then please re-tweet, share, forward, etc. UPDATE: We've seen a jump in signatures with folks re-tweeting, sharing, forwarding, etc. Great job everybody! More on the history and background of Release "Time Fades Away" Petition. Wow - so what IS Time Fade Away II exactly? Anyone know what the songs are on it/when it was? Why have I never heard of it? Exciting. Hamish, this is just my sentiments or thoughts,but upon reading the introduction to this topic, I got the impression that Neil has never been happy with the drumming on the night "Time fades away I" was recorded and that there is actually a recording of the concert on a different night (with a different drummer) that Neil has given the seal of approval to ,to release...hence "Time fades Away II"...For the life of me,why Neil has waited all these years to release this second version is beyond me..You try and work out Shakey's logic! Hey, like I said, this is just my theory..I'm probably totally wrong! Well I hope Neil does release the original 'Time Fades Away' album - it doesn't seem really be in the spirit of the Archives releases to only release an alternative version. Often those sort of things get bundled as bonus discs, like Pearl Jam have done lately with 'Ten', it seems that would be the best way to do this? 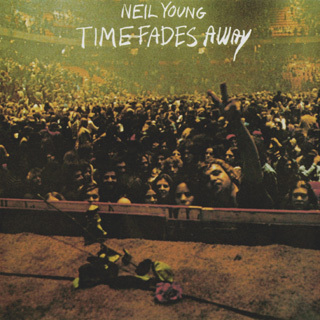 Besides, I'd love to know what Neil doesn't like about 'Time Fades Away' - yes it's rough and ready, but the emotion on it is INTENSE - as is the playing by musicians who at times appear to only half-know the songs - yet they hold it together brilliantly. It's certainly one of Neil's best albums. Please release it Mr Archives Guy!!! The thing that confuses me about that Neil quote, which I've seen before, is that all of the songs on "Time Fades Away" were from the second half of the tour, with Barbata on drums, except for "JTTP" from Feb. 11 (and "Love in Mind," which was from 1971). So is "TFA II" from the first half of the tour? It's possible that Neil chooses the best version of every song released in the original TFA. It should be something! I agree with all the reasons stated for releasing and revering the album, but my guess is that there must be something personal beyond what has ever been revealed about that tour and album that causes Neil to short shrift it. Must be something big given it's the only album left unrepresented on Decade- The Bridge at the very least was worthy of being included. I always thought it was just too painful because of Danny Whitten's 11th hour death preceding the tour. There is also the money disputes that went on, but I think we're grasping at straws, Neil has his reasons is all. The Detroit leg of the tour was the first concert I ever went to, and it was a great experience, especially the first half acoustic set. When the whole band appeared for the electric second half there was a discernible disconnect between band members, no interaction, very removed. It probably didn't help that they partook during intermission- I'm assuming. The only song that stands out in my mind is Don't Be Denied, and a very lethargic Alabama with Neil playing the Wing guitar. I also think that it is totally in the spirit of Archives to get an alternative version. In the meantime, we can only speculate so much. Hopefully if we ever see TFA II, Neil will fill us in a little more on the details, but only if it's not excruciatingly personal. I've read in some publications that several songs were recorded at the A & M studios by Henry Lewis and during the TFA rehearsals at The Broken Arrow Ranch. Look Out Joe, later released on TTN, comes from these sessions. Some songs, unreleased yet, could have been recorded. I mean Goodbye Christians On The Shore, Come Along And Say You Will, Letter from 'Nam. Nothing officially confirmed, but speculations of some studio recordings during the TFA timeframe exist. This just got posted on the rust list by Jules. Seems relevant. for a repetition of Harvest. My 2 personal favs from TFA are LA and Yonder Stands The Sinner.I love it when Neil screeches "SINNNEER!!" in Yonder Stands.Great stuff.ARCHIVES VOLUME 2 WHERE ARE YOOOUUU???!!! Well, you heard about the Great Pretender? Rancho,. I agree with you on the SSSIIINNNNEERRMAN! TFA I CD cost me 160 bucks cause I got reversed on an import with the exchange rate .Thought it was $40 - damn british poundage. It's now my most valuable Neil treasure, HA! and the blue ray ARC-ives only set me back $50 more that that. So.., it's all rock and roll to me. Once you get yer hands, ears and heart on it it's priceless anyway. there are some heartbreaking descriptions of the Ranch rehearsals with Danny in Shakey. There's no way Neil's going to release any of that.